Some coins are admired by collectors. Many are coveted. Only a precious few are truly beloved. Early United States coppers (large cents and half cents) fall into this special category, and so do Capped Bust/lettered edge half dollars or, as they're widely known with warm affection, "Bust halves." Bust half dollars with lettered edges have undeniable charm, much like the copper coinage of early America. They were struck with screw presses, and each working die was prepared individually, the date, stars and lettering being punched in by hand. These elements resulted in a myriad of varieties. They've also enabled specialists to pinpoint just which die struck any given coin. And this marvelous diversity is the yeast that keeps interest rising in these coins. The term "Bust halves" actually applies to both Capped Bust half dollars and the Draped Bust coins that preceded them. Draped Bust halves, in turn, come in two types: one with a small eagle on the reverse, the other with a larger, heraldic eagle. For a short time at the end of the Capped Bust coinage in the late 1830s, half dollars of that design were made with reeded edges, after the introduction of steam power at the U.S. Mint made that technology possible. The Bust halves most collectors view with the warmest affection, though, are the Capped Bust/lettered edge pieces issued by the Mint from 1807 to 1836. These are the real heart of this fondly remembered era in U.S. silver coinage. Design changes occurred with great frequency during the early years of United States coinage, and often they were triggered by a change in leadership at the Mint. So it was that Robert Patterson's arrival as the Mint's fourth director in 1806 set the stage for a shake-up in designs across the board. Patterson not only saw the need for new designs but also had a man in mind to create them. His handpicked choice was a talented, young, German-born engraver named John Reich. The mint director appealed for authorization to hire Reich as a staff engraver, maintaining that "the beauty of our coins would be greatly improved by his masterly hand." His argument carried the day and, in 1807, Reich was hired for the less-than-princely salary of $600 per year, not much more than common laborers made at that time. Then again, Reich had little leverage: he had come to the United States as an indentured servant in order to escape the Napoleonic Wars. Reich's redesign was truly comprehensive, encompassing every coin from the half cent through the half eagle, the lowest and highest denominations then being produced. 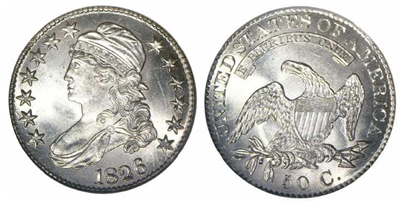 His basic obverse design was a left-facing portrait of Liberty with curly hair tucked into a mobcap, a bit of fashion featuring a high, puffy crown. As a consequence, this likeness is often referred to as the "Turban Head" portrait. Liberty wears a headband inscribed with her name, and she is surrounded by a circle of thirteen stars, with the date below. The reverse shows a naturalistic eagle with a shield superimposed upon its breast. The eagle clutches an olive branch, as well as a bundle of three arrows. Above the bird is a banner inscribed with the Latin motto E PLURIBUS UNUM. The legend UNITED STATES OF AMERICA appears in an arc around the periphery. On the Capped Bust/lettered edge half dollar, the edge bears the statement of value: FIFTY CENTS OR HALF A DOLLAR. For good measure, the inscription 50 C. also appears below the eagle. Reich was widely accused of basing the buxom Liberty on his "fat mistress," though no confirmation of any specific model has ever been found. Whoever she may have been (if indeed there was such a model), the Capped Bust coinage was clearly an improvement over the Draped Bust style. During the 30-year lifespan of the series, Capped Bust/ lettered edge halves were issued every year with the single exception of 1816, when a major fire destroyed the Mint's rolling mills and forced it to suspend all silver coinage. Mintages routinely exceeded one million pieces a year, reaching a peak of more than 6.5 million in 1836, the final year. The low point occurred in 1815, when just 47,150 examples were struck. Proofs of this type are known, but they are extremely rare. For almost every date, though, the total mintage is broken down into multiple major varieties, and these are what give the series its rich flavor and broad appeal. Overdates, deviations in the size of numbers and letters, shifts in the style of numbers-these and other varieties have captivated and challenged collectors for generations. The rarest of these varieties is the 1817-over-14. Only about a half dozen examples are known. Its rarity is underscored by the fact that the late Al C. Overton chose it as the cover coin for his popular book Early Half Dollar Die Varieties 1794-1836, which serves as the standard reference work on the series. Overton's book, which identifies and codifies the many die varieties, greatly spurred interest in Bust halves. Collectors have paid homage to the author, in turn, by using "Overton numbers" as shorthand for the coins. In the first edition of his book, published in 1967, Overton put into words the affection he felt for his favorite coinage series. In the process, he summed up the reasons so many other hobbyists also find them so appealing: "The collection and study of our first series of United States half dollars ... has intrigued me almost since I began collecting in the late nineteen twenties. These early U.S. silver coins are not only beautiful and fascinating, but due to the large numbers made and minting methods of the earlier years, there exists a myriad of die varieties and sub varieties, that seem to be unequaled by any other U.S. series, not even the large cents. This offers an almost unlimited challenge to the collector who wishes to become a numismatic student of the early half dollars [and] at the same time, most are within reach of the average collector." Capped Bust/lettered edge half dollars are plentiful in high circulated grades. They're also readily available in mint state grades up to MS-64. Above that level, however, their numbers drop sharply. The overwhelming majority saw use in daily commerce, though their high face value (nearly half a day's pay for many workers) limited that use drastically. Points to check for wear include the drapery at the front of the bust and the edges of the eagle's wings. BIBLIOGRAPHY: Breen, Walter, Walter Breen's Complete Encyclopedia of U.S. and Colonial Coins, F.C.I. Press/Doubleday, New York, 1988. Overton, Al C., Early Half Dollar Die Varieties 1794-1836, 3rd Edition, Escondido, CA, 1990. Souder, Edgar E., Bust Half Fever, Money Tree Press, Rocky River, OH, 1995. Taxay, Don, The U.S. Mint and Coinage, Arco Publishing Co., New York, 1966. Yeoman, R.S., A Guide Book of United States Coins, 47th Edition. Western Publishing Co., Racine, WI, 1993.